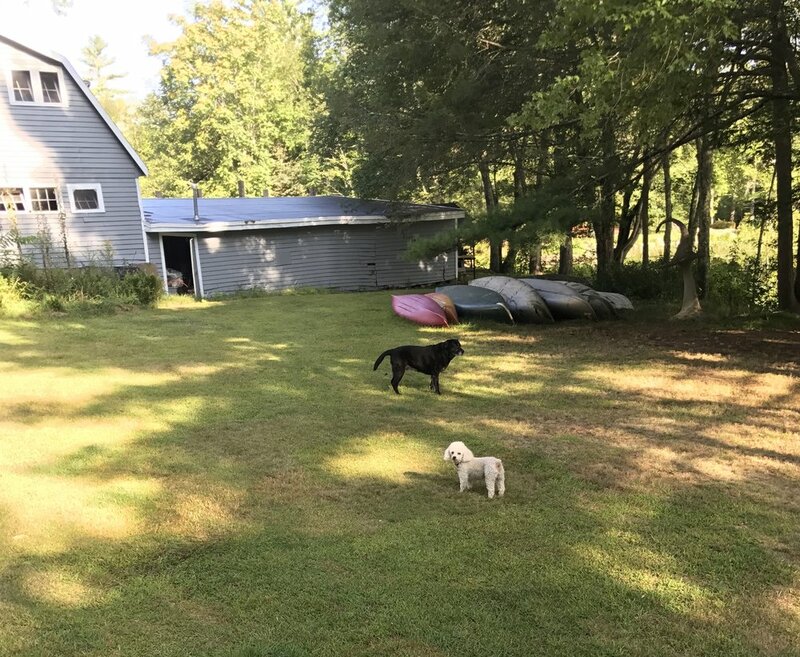 This morning, as I descended the steps of Cottage Duality, Maggie and BeeBe excitedly run toward the pond where we have our off-grid camp kitchen, called the party room. Historically, the party room was always central to where the food and drink went for parties near the pond. It's morning, and the dogs are hungry. They run, stop, turn around to check that I'm following, then continue. They prance and hop, happily. I am different when I'm here in nature. So is our miniature poodle, BeeBe. She eats on a regular schedule here like our black lab, Maggie, instead of grazing throughout the day, like she does when she stays in the city. Both sweet dogs are elders, and rescues. I am different here because my pace and perspective slow down when I'm in nature. Nearly three and a half years ago, our main house suffered a massive fire that temporarily suspended all dwelling possibilities here at Still Waters. That was not in our five year business plan, nor in the non-existent crisis management plan. Major oops. When in nature, one learns how to adapt. So we are fortunate that we have cottages that allow us to stay here while things get sorted out and the main house is reconstructed. A massive, complex undertaking. It took just over three years to settle with the insurance company, and we had to take on an extensive loan to do more than just repair the fire damage. It was what was required at this stage of the property and the main house. Change was eminent. But what really needed to change, was me. It was always me. Change always comes in life. Either we choose it, or we will be dragged. Either way, it's coming. We don't always get to choose what the change looks like, do we? But we can choose how we respond to that change. I awaken on a bright, late August morning, and it's chilly outside. I bundle up in layers. My husband puts the coffee on, and gets to work right away. I take some time to write and commune with the beauty that surrounds me. I'm feeling blessed. The day will be spent shopping in the local farmers market, setting up the model bedroom's layout and decor, and making plans for the future when we reopen this magical place.